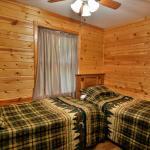 The cabins at Deer Trail Lodge Resort are located in Northwest Wisconsinâ? 's Chequamegon National Forest on the scenic shores of Lake Delta near Iron River Wisconsin. Each waterfront cabin features a fully-equipped kitchen with a microwave oven stove refrigerator coffee maker and kitchenware. Heating and air conditioning are also provided. Guests can enjoy fishing and swimming at Lake Delta or take in the scenery on a walk in the wooded acres. Duluth International Airport is 79 km from the property.